But Stella, don’t you want to wear these dark jeans? These are great pants! I am in the kids’ bedroom, negotiating for what feels like the millionth time what my 3 year old will wear that day. If I’m on the ball, I try to pick out her outfit and bring it to her in another room while she’s distracted watching TV. If I don’t get that done, we end up going rounds about what to wear (no, you can’t wear your swimsuit top in the middle of winter). Stella: NO, Mama. I want to wear THESE (horribly ugly fleece lounger polka dot pajama) pants. They’re my FAVORITE. Me: But look at these jeans! They’re so nice and have a BUTTON you can fasten all by yourself! Stella: No, Mama. That’s okay. I love THESE pants. They’re my favorite and I want to wear them. They’re my comfy pants. Me: [in one last desperate attempt to avoid those ugly pants] But they don’t match your shirt! Me: [big sigh] Okay Stella, fine, you can wear your comfy pants. Stella: THANK YOU, Mama! I LOVE these comfy pants. They’re my favorite! oh my YES! This is my battle daily with my 3 year old. Unless it is a school day, I just shake my head and take her to mom’s dressed however she choose as long as it is weather appropriate. I have decided that is a hill that I don’t want to die on & especially not when I’m trying to get to work on time. She has a very strong will. Praying for you guys as you experience this first, different Christmas. 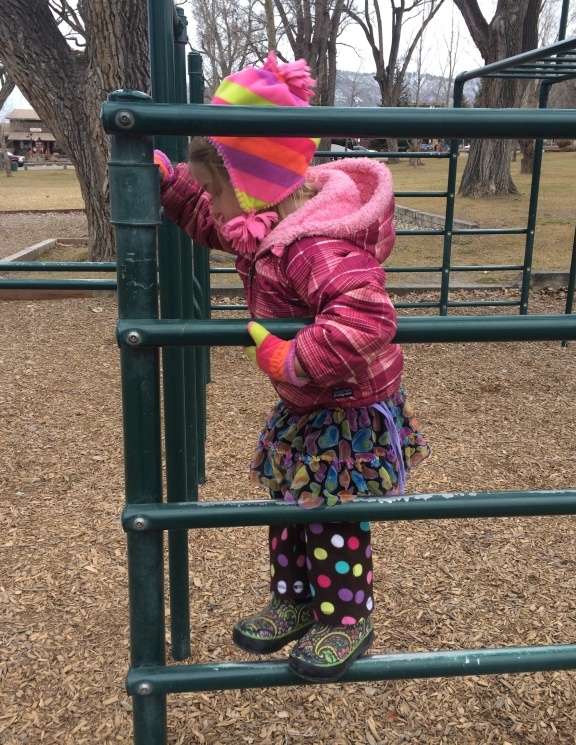 Yeah, most of the time I just let her pick out her own outfit, but when it’s not weather appropriate, I sometimes have to put my foot down. 🙂 You’re right though – outfit battles are not a hill I want to die on either! good thing you’re taking pictures! when she’s 16 she’ll be horrified with what she wore 🙂 my son is also 3 & his favorite is sans clothes. thats a tough sell in mn! When we got to 3 with the kid, I started reminding myself of Khalil Gibran’s poem On Children very often. It reminds me that many battles just aren’t worth it and that all of parenting is letting go. The video of Sweet Honey in the Rock singing “On Children” is also amazing. Three year old logic is astounding and funny when it isn’t frustrating. We entered the terrible twos at 17 months plus…and this battle on what to wear has been on for a while too, and we are still a fortnight away from being 3. It is not really worth it. All I can say is: Good Luck! This made me laugh. We have been in this place for about a year. Luckily most of the time he doesn’t care if I pick his clothes but when he picks it’s always the same few non matching things. Daily battle here until I gave up. There’s one pair of fleece pants I’ve designated as “weekend only”, but other than that, X can choose whatever is clean to wear. Of course, he’s a boy and it’s mostly khaki and navy in his pant collection. 🙂 He hates jeans, and buttons. Boys!